I hung it on the inside of the pantry door and was therefore able to free up a lot of space in the cabinet in the kitchen. I use it for lighter items and now have enough room in the cabinets for cans and jars etc. I would have liked it to be a little wider.And we did use the screws to make it more stable. Did not fill my needs or expectations. I looked forward to using this to open up shelf space, however never would have purchased it because nowhere in the description did it say it needs to be anchored with screws into the door. And the directions only included it as an "option". Well, since I rent, I chose to try it without. As you might figure, after filling it have full with light boxes, etc., it all came crashing down. I have other over the door rack for towels and clothing, and have never had this issue. This is flimsy, and anything but up to my expectations of products from Miles Kimball. I like my storage shelves and would recommend them. This product makes great extra storage for closets. Stores my spices securely and in such a way I can read the labels. I bought it for my movies,because i had ran out of room.I love the rack, because i can use it for my DVDS and vhs tapes.I am so glad i found the rack, it is awsome! I am happy with the storage rack. A convenient unit for extra storage. Recommend using lightweight items like spices, etc. I bought this product to store my Cricut cartridge boxes and large punches and other items I use for my scrapbooking. Fiit perfect on my pantry door. Now my pantry isn't cluttered any more. I bought 3 and use 2 on the same door - one each side - in the basement storage and the other in my office. No installation required although I secured it with a couple of extra clamps as the door swings very often. For ordinary use these would not be required. This came in very handy and spices are now alphabetized! I use it for spices and they're all in order. I WOULD CERTAINLY PURCHASE THIS PRODUCT AGAIN. I FINALLY WAS ABLE TO EMPTY MY GROCERY BAGS WHICH WERE SITTING ON MY PANTRY FLOOR. AND USED MY 2ND UNIT TO EASILY STORE ALL MY PLASTIC STORAGE CONTAINERS. YEAH !! I am very well pleased with this product and would recommend it to anyone who needs more storage space. Installs easily and is a great storage solution for a tiny kitchen. It makes a great pantry. I used only the top half on the pantry door to keep meds away from children and keep spice in a visible and easy to reach place. This product eased the shelving which was bulging in the pantry. I was happy to find it well within size of the door and allowed door to shut tightly. Our spice cupbord was jammed as well as our pantry shelves. How great to be able to open the door and see the hidden things right where needed. Space was good holding in small items but with plenty of height for the extra buy one get one items.Once it is about half full it doesn't bounce or move, but is sturdy and strong. I like it. I love the idea but I didn't measure my pantry doors and this item is too wide to fit in my kitchen. I bet I'll find another use for it in another room. 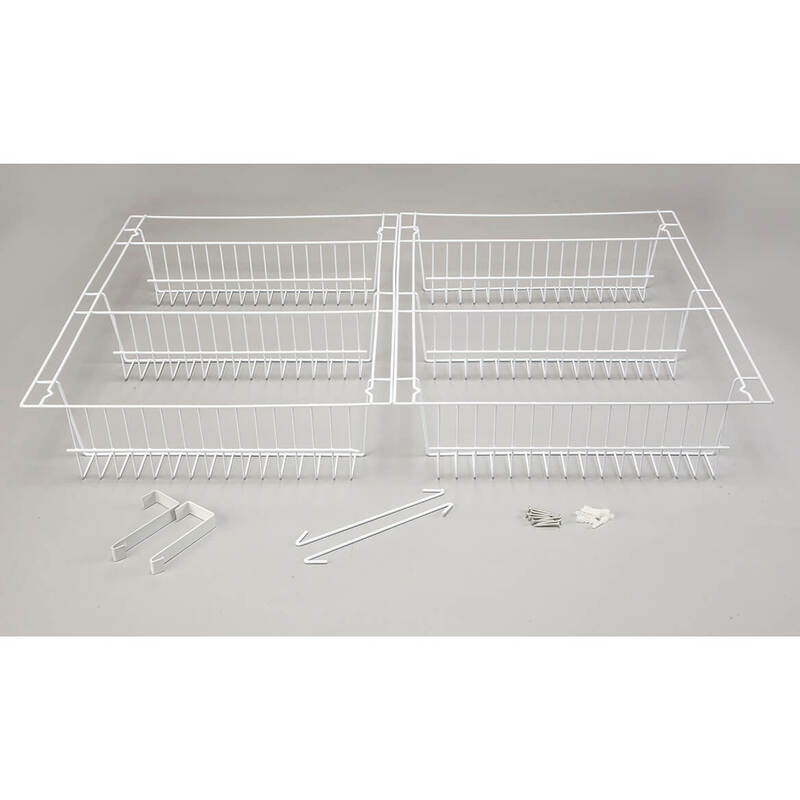 Once you've secured the over the door rack with the enclosed screws, the unit is very strong, sturdy and able to handle small and good sized items. We have ours in a storage room in the garage and it works great! It's something I've been looking for but was too expensive in the store where I found it. It was much more affordable from Miles Kimball. I love it. It has extended my pantry! I was so pleased - I bought another one. Being single it was easy for me to install..
Got just what I ordered and Quickly! We have used the shelves to get rid of the clutter in our cabiets. I turned two closet doors into discreet, more accessible storage spaces for pantry items that I didn't have cupboard space for. It is easy to organize my items, and easy to see what is on hand. No more bending down or kneeling on the floor with a flashlight to see into the low cupboard I have. I am very pleased with their slim size and quality of the shelving units. Fabulous rack - so useful! Currently use one in kitchen. Easy to install and hold all those light items that tend to get lost in my pantry. Great for spices and odds 'n ends. Thinking of getting a couple more for guest baths to hold combs, brushes, clips, curling iron and hair dryer. The vinyl coating makes cleaing so easy. I love this over the door rack, it great! Just what i had been searching for. I am so happy that i found and purchase this item. It works great for my dvd movies, and my vhs tapes also. My neice saw the rack and loved it. So i ordered her one also. Thanks a million walter drake! I bought one of these before and I really like it, so I bought another one. It makes things look great and organized. My husband uses a lot of supplemts, this get them off of the counters and out of the drawers. There was enough space between the racks to put taller items. I LIKE THE ADDED SPACE TO MY PANTRY. I USE THE PRODUCT FOR EXTRA STORAGE TO MY PANTRY. we have an Airstream trailer so anything to use the space effecently is a plus. We have a closet in the kitchen for clothes that hang up, we put the Storage Rack on the side and in back of the clothes works like a charm. This item is great for small kitchens. I needed the extra space for my packaged foods..
" Shake hands with a winner"
Easy to install, lot's of storage - what's not to like? Use it to store canned goods in the pantry. Allows organization and visibility. Pantry shelves are now used for non canned goods! We have more room in our pantry! The full pantry now has room for us to see things that aren't lost. I am a crafter. I purchased this storage unit to store my ribbons. Rather than attaching the two units together, I added my own over the door hooks and made it into 2 separate units. It works beautifully. My spools of ribbon are now organized and color coordinated. I like this unit so much and the price is so good, I decided to order another unit.....I have many, many spools of ribbon. Wish I could post a photo....truly happy with this purchase. it to anyone who needs extra storage. One in the kitchen to store spices and other light weight items and one in the guest bath closet so my guests have room for their toiletries. They love it and it keeps the counter clear. I love my over the door rack!! It is perfect and holds so many canned goods. It certainly frees up the pantry and provides extra storage. I would recommend it to anyone!! It is sturdy and does not shift when the door is closed. Love it!!! I love this neat storage product. Used one in my pantry for extra storage & one in my master bath to de-clutter countertop. Love them both. I gave it to my daughter for her pantry door and she was so excited and trilled to have more storage space in her pantry. It's easy to see items she has on hand. She said she absolutely loves it and it's one of the best birthday gifts I've ever given her. I have searched for this product for months and found it here..It has exceeded my expectations..Easy to assemble and mount on door...Great product. I love these shelves. My pantry space beneath the steps is small, so I have these hanging everywhere. I am planning to get some more. They are perfect for storing your plastic containers and lids, too! It would be useful if the back of the shelves had a slight ridge or wall to keep things from falling out the back. I love this rack. It has given me more space in my pantry for smaller items that got lost so to speak in the bigger part. We have three of these. One is on the inside of the pantry door and holds large spice containers, bottles of vitamin supplements and more. The other two are on our home office door and a guest bedroom door, holding books, as we have a fairly large library. Very handy. You can use the full length of it on one door, or half of it on one door and half on another. ok,so it's not so "over the door". it has hangers but does not stay in place. but as much as doors open and close,what do you expect!? as for the quality and durability including the price.....excellent!! i have one of these and am purchasing another!!! i simply separated the two pieces and have them hanging on the wall. i chose to have one in my bathroom and one in my closet to hold cleaning supplies. exactly what i was looking for!!! thankyou Walter Drake!!! My over the door kitchen pantry works great. I now have extra space in the pantry with no more shelf items stacked on top of each other or hidden from view. Organised is what I now have. Yes, I kept my shelf rows neatly to begin with, yet space was the issue. Now, no problem. Thanks for this item that easily hangs over my kitchen pantry door. I use this as extra storage place on a pantry door. It is great for spices, and many other food boxes. Really gives lots of added storage space. Where I live I can't attach anything to the walls so I used Velcro to hold it against the door and it worked great. I would reccomend this product!! It was easy to assemble. screwing the shelf into my door for stability was the only real physical work involved. This door rack is very easy to set up and use. We moved to a smaller home with less storage space. I Needed something for my canned goods, as the pantry shelves were small and couldn't stack much on them without bending. This rack added my needed storage and is hung on the back side of the door out of the way. I purchased the over the door food rack , I love it ! I have a small pantry so I tried it and I love it . I will buy from you all again . So good to deal with professionals! The over door just fits my door just fine ! I bought this item to store dvds. It holds a lot and I don't have to worry about it falling apart. It's sturdy and it'll make any area you use it in look neater! Great little shelf for the price! We bought two of these for our kitchen. One holds all of our teas and coffees, the other is filled with spices. It gave us a lot more cabinet and counter space. We drink a lot of tea and I cook with many different spices. My husband is thinking he might be able to use some in his workshop. These were better than I expected. A "Must Do": attach this to the door. I've used racks in the past and had problems when they weren't attached. Also, for small items, I put a piece of cardboard liner on the bottom. Another hint: Allow for your doorknob (if applicable), making sure you have enough install-width. I really like the space that it givin me . love the space that has givin me. We have a smallish kitchen, not much storage space. I needed room for canned goods, and boxed goods to save space in the cabinets. This item takes care of this need, and actually hides the items because I have the rack on the inside of the door facing the basement. Works great for me. I really liked this unit it saved me lots of shelf and counter space plus holds extra of any thing you want out of the way. Great over the door rack. I really love these over the door storage racks. So much so that I bought one for all the closet doors in my home. Recent surgery, lots of new medical supplies needed within reach. Perfect on the back of the bathroom door. Would be great on the pantry door also. Yes, I want more of these. It holds a lot of the small things that I need in the kitchen, but they take up to much room on the shelves. My storage space is so limited that these help to keep things visible easy to find and leaves room on shelves for the cans. Very good product! If anyone needs a little extra storage space, this is the answer! I have wanted one of these for several years, and for some unknown reason, kept putting off ordering one, but finally did, & I am sooo glad I did! It is exactly what I thought it would be. We hung it on our door to our back porch, where we store much of our "extra" non-perishable foods, and now we can open the door and there a lot of it is! Handy! 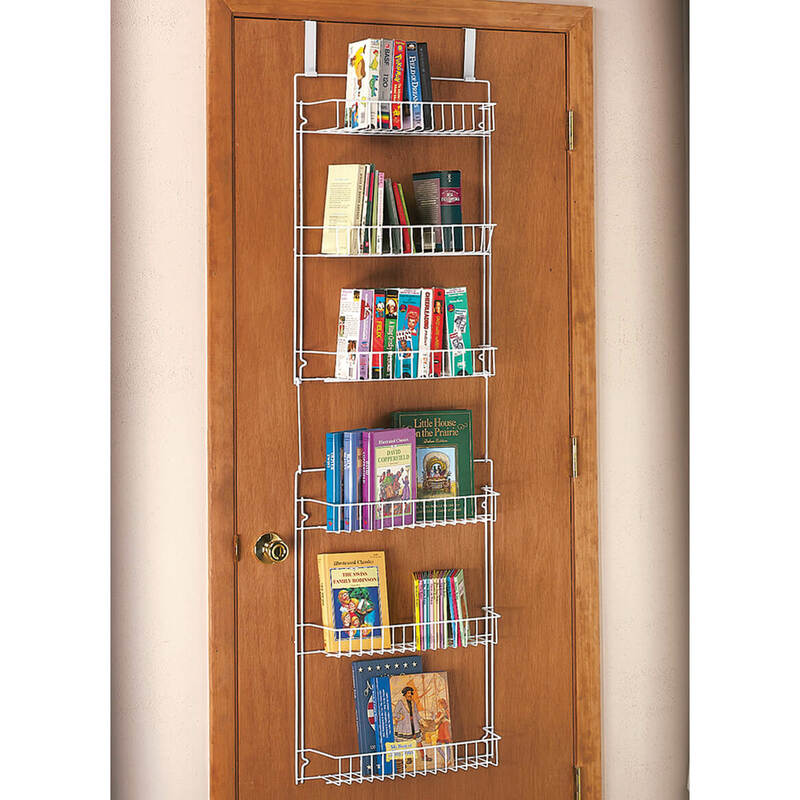 I used this over-the-door storage rack for light-weight items that cluttered my storage area. I stored heavier items on a shelf, so I don't know whether or not it is suitable for heavy items, but it worked perfectly for my needs. #sweepstakes. When I received my over-the-door shelves, the two hooks that go over the door to hold the shelves in place were not even. I called customer service and got the nicest man. He went way beyond what I had imagined to make sure my issue was resolved. The shelves are now in place and full of our kitchen necessities. Great job Miles Kimball! Excellent wire rack for storing the lighter items in my pantry. Fastened to the door with the included screws but added washers for extra support. This will hold all of your lighter items even jars and some canned. Made better than most comparable racks with plastic rails. We had purchased one sometime ago and use it on the back our our Pantry door in the kitchen. Perfect for all those smaller items that you don't want getting lost in the pantry. The one we just purchased is for the back of the door in our laundry room. Holds all our cleaning supplies & more. Frees up shelf space in closets. Puts frequently used items close up and easy to find. I have a hollow door for my tiny pantry and this over the door storage unit does not really need a ton of screws to hod it in place! I also love the depth of the shelves! This is my second over the door rack. This over the door storage rack adds a great deal of additional storage. I put it on my pantry entry door. It holds the light weight items such as instant hot cereals, boxes of tea, bags of croutons, packs of microwave popcorn, preparation food packets (instant gravy, onion soup mix, etc). 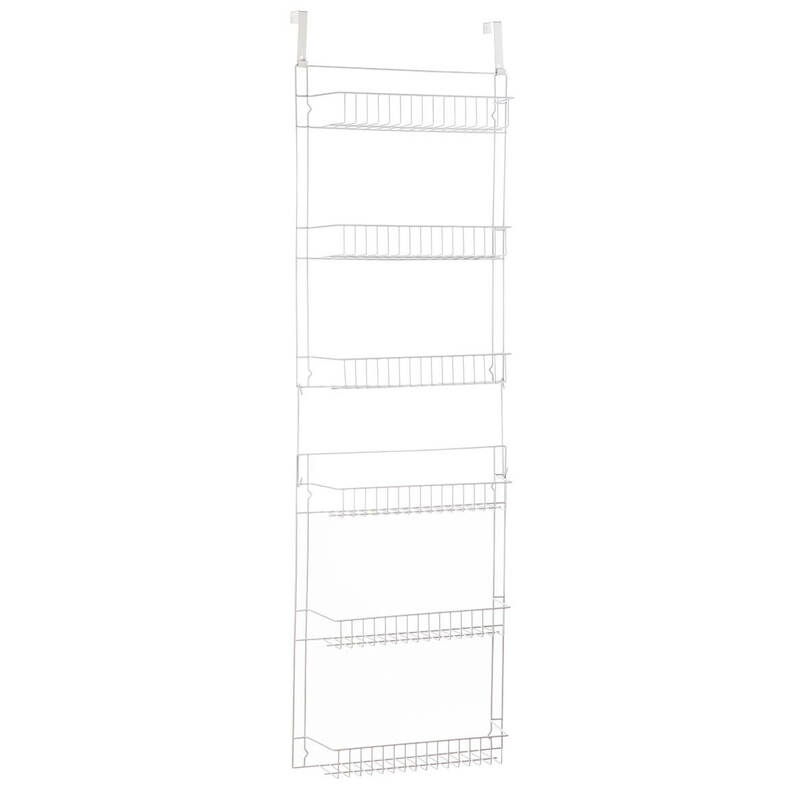 Since adding this rack, more "on the shelf" space is available for heavier items: cans of soup, tuna, etc. This item is just what I needed. Thanks. Wanted the shelves to be a little deeper to hold some small canisters that collect on the counter. It caused the door to be hard to close & it moves around too much if you don't screw it down. I didn't want to put holes in the door so we hung it on the wall in the pantry. It worked out fine. I'm going to order another one. I use it in addition to my kitchen pantry. It saves me room for larger items on the shelves. Would like to see 2 more top hangers and a few clips to stabilize the center section when attached. Ordered another for the bath. Great for toilet paper and larger bottles of shampoo etc. Okay but may not be the best! My pantry is not very big and this product helps extend space for my pantry! I purchased 2 racks. the one for the bathroom/laundry room door fit perfectly, however the one for my kitchen pantry door is about 2 inches too wide. Perhaps I measured wrong. Still trying to figure how to make it work. Didn't have enough cabinet space for food items, so the over the door rack worked like a charm. If I had another door to use it on, I'd buy another. The only reason I gave it 4 stars instead of 5 is I haven't found a way to attach it to the without using screws or nails. I live in an apartment. I tried double stick tape, but that didn't work. I plan to try Velcro next. Otherwise heavy items pulls the rack away from the door. I hung it up on the inside of my pantry door. It's slender enough that it does not bang into the shelves of my pantry, but deep enough to hold plenty of items. I cleared off a whole shelf! I did need to anchor it with the screws (provided) to the door, which was a pain only because I have a hollow-core door, but that hassel was the door's fault, not the product's. For anyone else who needs to do the same, you will need a power drill, drill bit, 4 plastic wall anchors, and a hammer. First, hang the shelves and mark the door where the screws need to go. remove the shelf, pre-drill the holes into the door. The packaging on the plastic wall anchors will tell you what size drill bit to use. Tap the wall anchors into place, re-hang the shelves, and screw in the screws. I'm going to get a few more for closets and garage. For me, this was the answer to organize my small pantry closet. The small stuff, like ramen noodles, pam spray, spices, they all get lost in the shuffle. Now they are where I can find them and my pantry shelves are doing what they should. I had my handyman come over and put it up, but I see now, I could have done it. The pieces on top of door are thin, so closing door no problem. He did anchor it with some larger head screws in 2 other locations so it wouldnt swing out when door in motion. Also got some shelf expanders. They are terrific. Because of limited space in my apartment,I wanted to try this rack.I hung it on the back of my front door and it's great.I have 2 more doors to hang a rack on and I will surely buy again. would buy again, fit right onto the door and has great space for spices and can goods. Command Metal hooks work well to hold this steady. would like a second set of over the door hangers. I am glad that I purchased this rack and I would recommend it. You may want to limit its use to lighter spices rather than canned goods. I've loaded mine up and I definitely need to keep the top hooks (that hang over the door) as wide apart as they can get to distribute the weight such than it does not bow up at the top under the weight of the whole rack. For the price and what it is, it is an excellent deal. I bet it would be plenty sturdy if you separated the two sections and used them separately. But, like I said, if you do not use it for canned goods, you should be fine. only con i have to mention it sort of "shifts around" on the door when opening and closing,also i wouldn't put any heavy items on the shelves. Just wish my door was not hollow!! I have hung on a door from kitchen to small laundry room. Problem is with a hollow door that the type of screws which came with the product do NOT hold the racks secure. I have used reinforced packing tape to hold and even that shifts the racks. Ideas? I wanted to clean off some shelves under my stereo so I bought this product to use on the back of my bedroom door. Most of the books I had on the other shelf fit on this, which left room for all my CD's,etc. I am not sorry I bought this item. It has helped me to arrange all my spices in a convenient place, and now they are easy to see and to reach. Also, I have placed my tin foil and wax paper in this unit, and it is easy for me to find. I have three of these racks; I use them to store my paperback books. The books fit perfectly, freeing up space in my book shelves. The only complaint I have is with the over the door hooks; they are built for doors that are thicker than mine, however, I attach a filler to make it fit and it works fine. I have a small but well organized home, however one can never have enough extra storage. I'm all about using vertical space and these shelves make it so easy to add space where ever you have a door that you can hang them on. However I bought 2 of these thinking that one of them would "just fit" on the inside of a super small linen closet and I didn't read the width correctly. I saw the 15" wide shelf space and not the overall width which made it just a couple of inches too wide to fit where I wanted it to go. But no matter, I just used both shelves on either side of a door in my laundry/pantry/kitchenette/craft room and I'm fine with placing them there because as I mentioned, one can never, ever have too much extra storage. If I could change or improve on it in any way, I think it might be nice if they came with optional covers in order to hide the items you're storing if even in a temporary manner so that you can keep things dust free and out of sight for a more clean look. That's just the neat freak in me though. I am putting together a space where I can do my crafts and jewelry and I have a need to store my supplies in an open space where I can access just what I need for the project that I'm currently making and this type of vertical storage allows me get to everything without having to dig through a bunch of large storage bins or even drawers where I sometimes have to dig to the bottom to find what I want. It saves me time and minimizes the clutter and cleanup by being able to have everything right at my finger tips when I need it. These types of storage would be awesome in various sizes that could be used inside nearly every cabinet or closet in every room in the house. It makes it so nice to be able to open a cabinet door and find what you need right there instead of having to reach to the back of the cabinet. Useing it for our pantry to put spices and things in love it Thanks Now their is no digging in cabinets to find what I need!!!!! I purchased this for a kitchen closet which is becoming a pantry, due to the needs of someone whose mobility is becoming more limited. I measured first to see if it would fit. When it arrived it appeared to be just the perfect thing to allow for more storage in the pantry. The problem was the over the door brackets were too wide and thick to allow the door to shut. So now once someone will plane the door on top and use some screws to secure it to the door, it will work exactly as planned. This product gives me the extra storage I need in a too small kitchen without taking up floor space. This is a quick and easy form of storage, and the shelves (particularly the one where the 2 units join) allow for taller bottles. I am using it in my locker in the boarding stable where my horse lives -- no muss, no fuss, if/when we leave since it is not something that has to be screwed down. Handy way to increase storage. This product really adds to storage space. I needed something on my pantry door to store my "K-Cup" coffee pods and spices. This was the perfect choice. I love it! Fit our need for extra shelf space. We have a mobile home, converted closet into a pantry, door a little smaller so had to make a small adjustment. Fits fine now. I am really glad I finally decided to purchase this. It sure has given me more space in my pantry. I use it for stuff my kids use the most. Now they have easy access to their snacks. The only downside is I'll probably have to screw in the shelves a little more so they don't move when I open the door. Otherwise, I love it. I prefer not to have the white handles showing over the wood door, so if there were some way to screw it down at the top so they don't show that would be much better. We had to cut them off and file them down on the top of the door so the door would shut. Otherwise it works great as long as it's screwed on tight. It makes it a lot easier to see what you're storing. I use this product over the door of the laundry room. Gives a lot of extra space to store little items, unseen! and easy to find! filmsy but I like it. I like it but it is too flimsy. When I open the door it sounds like it is coming off the door. It lets me have more room in the pantary. I would by it again. I thank I will buy another in a couple of weeks. I used it behind my bathroom door I just love it. I like that it can hang over the door. I also used the second one in my hall closet I can keep stuff I use a lot on the inside door. The only thing I needed to do was line them so thing's wouldn't fall through. I used it in a very shallow pantry to add storage space. I don't have a door to use in my kitchen so I bent the hooks and hot glued it to the top of my refrigerator so it hangs off the side. The product did not work well on our door so we put in on the wall. Very useful product. Adequate packing by third party shipper. since this rack came in 2 pieces,i seperated it to store my cleaning products. i tried "over the door",but it had NO stability whatsoever! but it works for me now,in fact i think i'll get another "set" for my paperback books. just hang with 2 small nails...yup its perfect! This product was delivered fast! I mounted it myself, but did use hollow-wall anchors w/washers at all the support points so it not only supported it but prevents it from moving and banging as you open and close the door. It is perfect for all the small and lightweight items kept in the pantry such as rice, noodle mixes, sauce mixes (I picked up a small basket from a dollar store to put them in), instant mixes of all kinds and all pasta. I was a little leary after reading the other reviews, but I am 100% satisfied with this product and it's price! I would reccomend this product. I use this product in my pantry. It has room for many spices. Also things like boxes of Jello. I covered Pasteboard with contact paper and placed it on the bottom to make the shelves more sturdy. The bottom rack is used for taller boxes.. Cake mixes etc. Everything is so handy with this product. I love it. This item really organize my sons VHS tapes. Only wish the over door hooks were better fitting, my doors aren't as thick as the doors in older homes, this flaw should be fixed. I had to adapt the over door hook so they don't shift. Once I did this this item is great. Hung on door in kitchen of mobile. Could be improved with back on each shelf; had to fasten to door with screws to make stable. Adequate strength for use. It hangs on the inside of the door to the pantry. 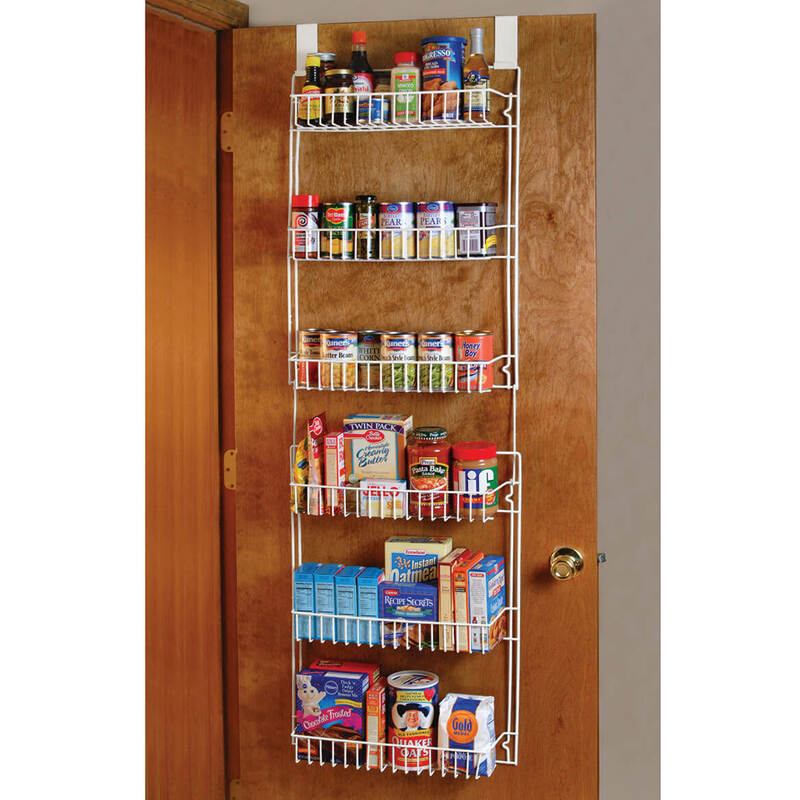 Perfect for door in pantry, provides much needed extra storage for canned goods. Unbelievable how much it holds. I purchased this rack to store craft paints & other items that I previously had stored in boxes. I love that it hangs right on the back of the door & I can see what I have & don't have to go searching for it. Only issues with it are: 1) wire baskets don't allow small items to stand flat (I just added some decorated cardboard & problem fixed), 2) wish there were another way to anchor besides screws. Otherwise, I love it!!! I use in kitchen and works well since I rent. Had to n ail down since a bit flimsy. Good price. A versatile item that could have been constructed with a little heavier wire. Was able to easily adapt for safe can (think pantry expansion) storage. For office was perfect in storage closet. This fits good over my closet door for extra storage as I do not have a pantry. It has lots of space. I use this product in all of the bedrooms, bathrooms and laundry room! It holds all manner of things: cleaning products, clothing, pantry items, kitchen items, bathroom items, just about anything you need to store..put this on the door and voila! you have extra storage! For the price you can get more than one! I use the rack in my bathroom to store anything that would clear space at my sink and under my sink. My bathroom is very small so I needed the extra storage space. I think the rack is lovely. It is a nice clean white. Lots and lots of storage space. I had two issues in the beginning but I fixed them. First, the hooks that hang over the door would tilt forward which led me to not be able to close the door. So, I hung it on a 2nd door I have in my bathroom that is thicker. Problem completely resolved. Secondly, the rack swings a great deal when opening and closing the door. All I did was buy some tiny hooks from the store that stick to the door, and I hooked the rack onto those. Problem resolved.I would also like to add that the items would slide around a lot when opening and closing the door. I bought some shelf liner and cut it to size for each shelf of the rack and it fixed that problem as well. It looks really nice. I'm so happy I bought this product. I needed extra storage space in my small, guest bedroom. It holds guests' foldable clothes and personal articles with space leftover to store extra toiletries. It's not exactly what I expected it to be. I finally got a friend to put it together and put it up for me. I haven't put stuff on it yet. Will do that soon. So far, I have put my bottles of vitamins in it, inside my closet door. This way I am reminded to take the vitamins every time I use the closet. decide to put in it. I bought this a similar rack like this over 5 years ago and hung it on a wall in a under the stairs closet. My husband screwed it into the wall and been there ever since works great and very sturdy. This one I use in my home office closet and we didn't want to hang in over the door and he screwed it into the doors. Its a hollow door and took some patience do get it up. Works really good and lots of space. Which I uese it for my Christmas bags and bowl and other bags for different occasions works great and makes things so organized. Love it will definitely recommend it to anyone. I used this on the back of my pantry door and found it very useful for increasing my storage and for putting small items out where I could see them. I bought two racks, one for my kitchen pantry and one for my bathroom closet. They really help out. After reading reviews I knew I would need to make adjustments to stabilize this unit as it is on a kitchen exterior door. I used the screws on the over-door-holders and then instead of screwing the shelves into the door, I used double sided cable holders and cable ties. Fewer holes in door. Great way to add storage in walk in kitchen. My husband had to adapt to make it a wall mount but in doing so, I was able to use. Price was very good. I live in a very small apartment so storage space is at a premium. The over-the-door storage rack helps by utilizing space in my coat closet to store dry goods such as cereals, pasta, and more. It's sturdy and not flimsy at all but I wouldn't put anything too heavy on the racks. I now have three! Great for holding cleaning supplies and my vast collection of paperback books. I did have to add a piece of cardboard to the bottom of each shelf to keep the books from tipping to the back. One holds all of my VHS movies, perfect fit. It actually holds a lot and is pretty strong, but you really do need to use the screws that come with it to keep it from falling down. I used my 2 over the door racks to put in my closet to put such things as condiments on in one closet and the other I put in the bathroom to put body wash and hand soap and things like that on works great! the rack is nice for the price, the only thing is it moves when you open the door, but I fixed that by using 6 command metal hooks 3 on each side and it stopped the movement and made it secure. With the command hooks you don't have to put any more holes in the door. I would buy this product again - I have 3. I am using this on the inside of my pantry door for my spices. Then I have one on the inside of 2 bedroom closet doors to hold the small things that would normally be in the upper part of the closet. It seems light weight, but good for storing all my boxed mixes, and pouches of soups etc. It was too wide for my door at the top, but will find something to fill in the gaps. Bangs against the inside of the door, but will tie it down with some pretty ribbon. It gave me much more room for storage.